When you think about spring cleaning, you probably make a mental checklist of all the things you need to do. Perhaps you want to get the carpets cleaned, steam the curtains, vacuum under all the furniture, and donate all the clothes that don’t fit anymore. But there is something you should add to your spring cleaning list: Clearing out your bathroom cupboard. Your dentist in Sunnyvale helps you decide which oral hygiene products to throw away and which ones to keep. Remember that tube of toothpaste you bought ages ago that somehow got shoved into the back of the cupboard? If it has been stuck back there collecting dust for a few years, it might be time to throw it away. Check its expiration date; if it is more than a year past that date, you should toss the toothpaste. Yes, a year. Most toothpastes are good for 12 to 18 months past their expiration date. Using old toothpaste won’t harm you, but it won’t help you either. The paste may lose its effectiveness and not clean your teeth as well as it should. Toothbrushes last an average of three to four months, but that isn’t a hard and fast rule. When you notice that the bristles on your brush are frayed, or if it has become uncomfortable to use the brush, toss it out. It’s also important to take a look at your kids’ toothbrushes since they may not always be aware that what they’re using to clean their teeth has lost some of its efficacy. Mouthwash usually stays good for two to three years after its manufacture date. Beyond that, the antiseptic in it (like the alcohol) may break down. If anything about your mouthwash doesn’t look, feel, or taste right, throw it out and head to the grocery store to pick up a replacement. 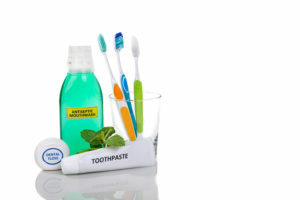 You may also want to throw it out if your oral health needs have changed and your family dentist in Sunnyvale has suggested that you start using a different mouth rinse. Your floss is the wrong thickness for your teeth. If it is hard to fit into those tight spaces, you might need to buy a thinner variety. You use dental pickers. These are great for spot cleaning between teeth, but they aren’t as effective as regular string floss. If you want the freshest, healthiest mouth possible, be sure to include your bathroom cupboard in your spring cleaning routine. It might be time to say goodbye to some old, ineffective dental hygiene products! Dr. George T. Philip is your friendly dentist in Sunnyvale. He is always willing to answer any questions his patients have about oral hygiene or dental products, so why not pick his brain when you come in for your next appointment? Please feel free to contact us at 972-285-6144.